The Switch and Spin Magnetic Gear Board helps practice hand grasp, control, coordination, cause and effect and problem solving. Description: A unique spin on magnetic toys, Switch & Spin Magnetic Gear Board lets kids build their own toy! Simply choose a picture template from 10 unique designs and place it in the wooden frame. Then add the gears in the color-coded spaces to turn each picture into an amazing kid-powered machine! Or remove the templates to reveal the white magnetic surface–perfect for an open-ended exploration of simple mechanics, or a range of counting, adding, and problem-solving activities (instructions included). 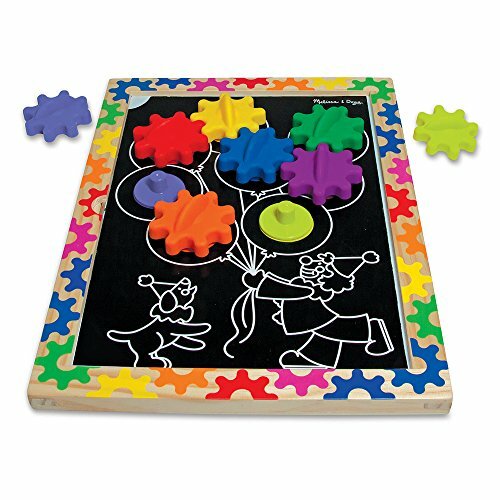 This sturdy, durable gears toy includes a magnetic board with wooden frame, eight magnetic pegs, eight colorful gears, and five double-sided, color-coded design templates.